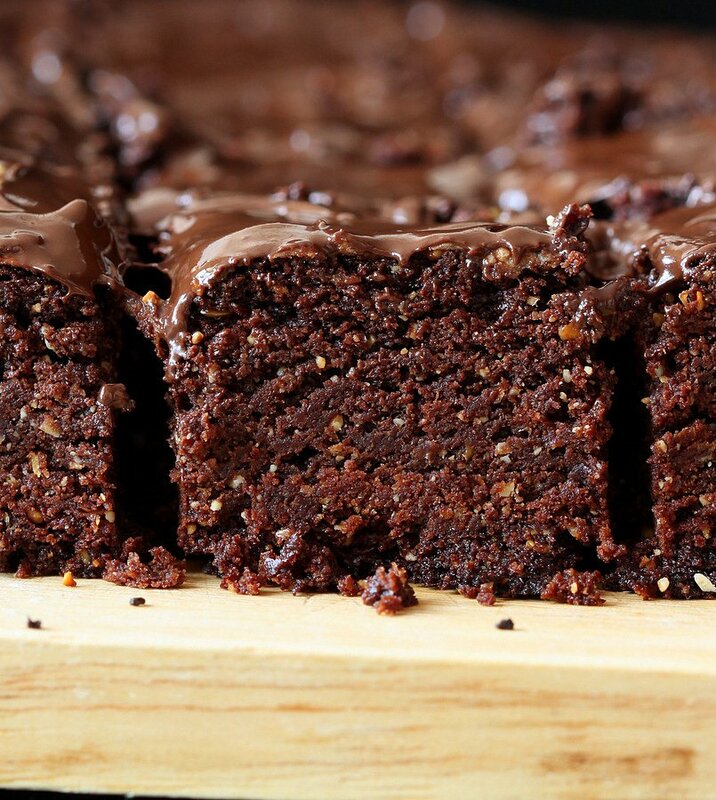 These insanely chocolatey brownies is one of them. It is one of those days when I am tongue tied.. I have no clue what to blab about on the post. So I will let these beauties speak for themselves. I was going to edit pictures of another sweet potato or cauliflower dish(really:). But I made these brownies again yesterday and they reminded me that they need to be posted! For more baked desserts, cakes, cookies see here. Grab a bite and then try to explain to hubbs through full mouth mumbled jumbled words and moans about what he is missing. He is going through a not a big chocolate fan phase. Good for me! I need that coconut milk to down another one. 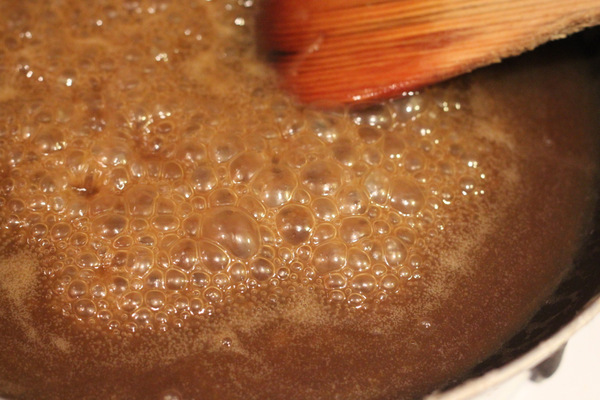 Mix all ingredients for the caramel and bring to a bubbly boil. Add coconut cream slowly and switch off heat once it starts to boil. Add the triple treat of chocolate, oil and sugar and mix until homogeneous. Add to warm chocolate and mix until well distributed. The key to brownies not falling in the center is to make a really stiff doughy batter. The chocolate melts while baking. that means that the batter will become too viscous/high moisture causing the center to not hold during baking. 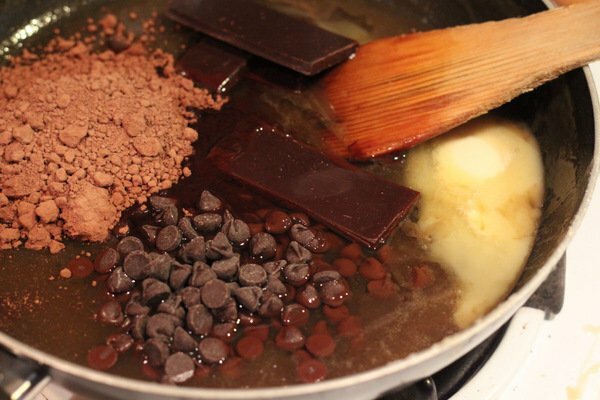 If using melted chocolate in the batter, keep the batter like a dough and not a flowy cake batter. Press the mixture into a pan. Bake until almost done. 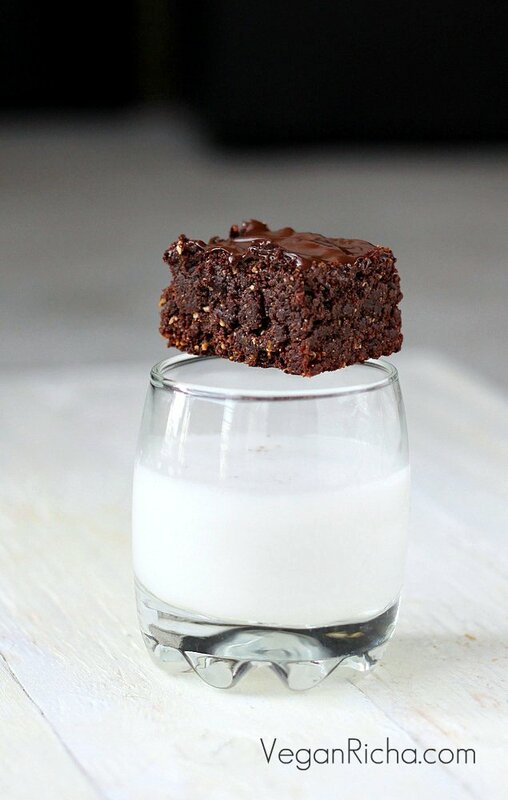 A little longer for sturdy brownies and less for more gooey brownies. Try to keep some for others. Allergen Information: Dairy, egg, corn, soy, yeast free. 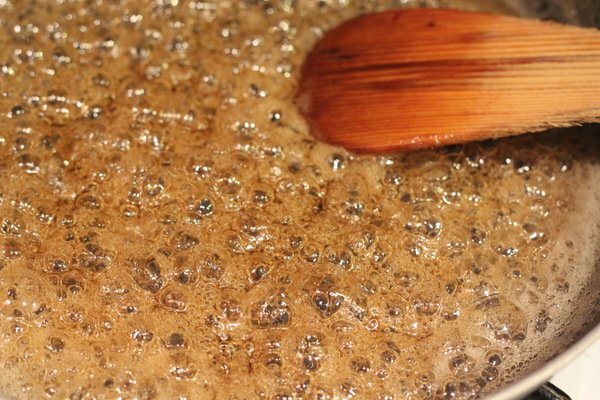 In a medium pan, mix the sugar, maple, molasses and water and mix on medium high heat. Stir occasionally till the mixture comes to bubbling boil. Add coconut cream slowly and mix well. Add sea salt, mix and take off heat as the mixtures comes to a boil. Add cocoa powder, chocolate chips, dark chocolate, sugar, oil and mix into the hot caramel until melted. Mix flaxmeal in water and vinegar and let sit for few minutes. Mix to combine well. It will be a stiff dry-ish mixture. 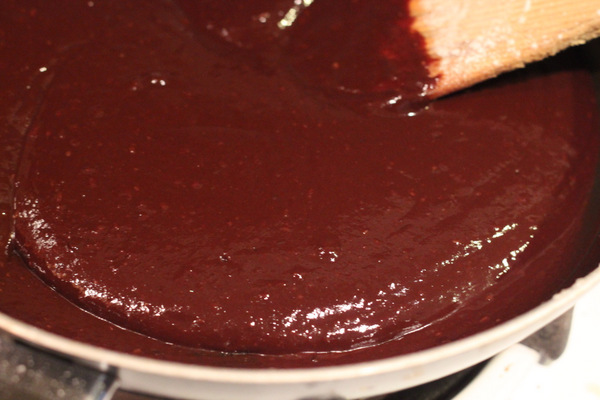 Mix by picking up the melted chocolate mixture and folding and pressing until well combined. Add chopped walnuts if using and mix in. Drop it into parchment lined or greased pan. Press and even it using a spatula or hands. Bake 30-32 minutes at 365 degrees F. Bake till the toothpick an inch from the edge comes out with a few crumbs. do not over bake as the brownie gets hard quickly. Once out, sprinkle about 1/4 cup chocolate chips on top, return the brownie to the warm oven for 2-3 minutes then spread the melting chocolate chips for a quick ganache. Let cool for 15 minutes before slicing and finishing it up. (if using parchment). Let cool completely if using greased pan. 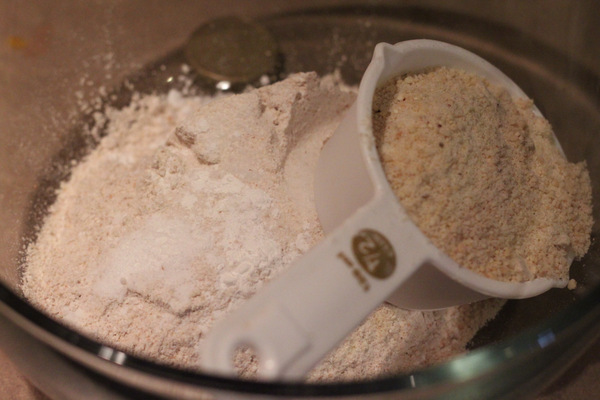 If using a different flour, start with 3/4 cup and add more only if the dough is wet. If you are substituting the cashew flour with flour or other nuts, add 2-3 Tablespoons more Oil to the mixture. Keep the dough on the softer side and under bake for best results. If they end up dry for any reason, warm them up in the microwave before serving. These brownies are being shared linked up virtually 😉 at Slightly Indulgent Tuesdays, Allergy Free Wednesdays Rickis wellness weekends. 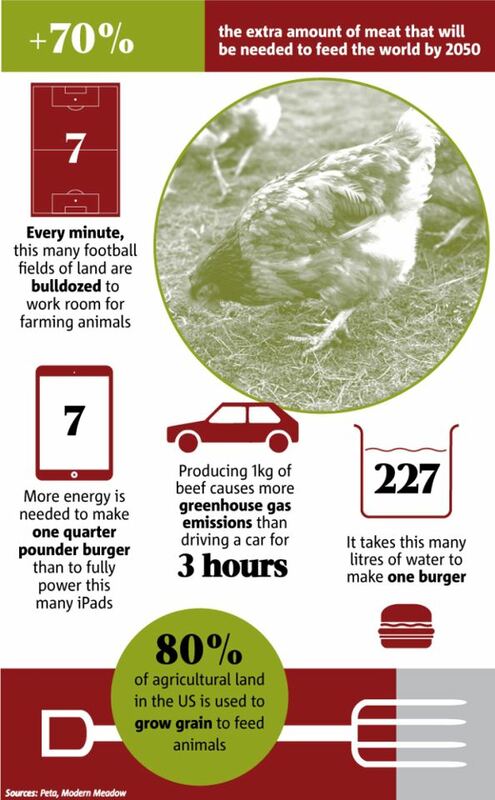 Industrial meat production is not sustainable – and “sustainable” meat is not viable. Make this a Meatless Monday with these brownies and this burger, and see how good it feels not to eat meat – you’ll want to add a few more meatless days to your week! How do I print this out? GIRL! 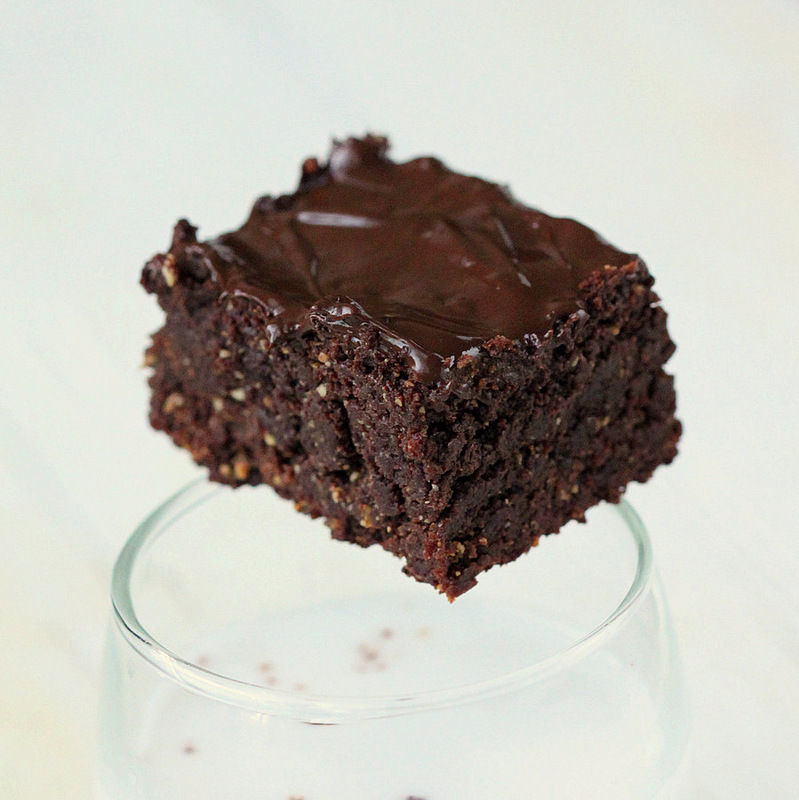 these are truly the fudgiest, moistest, most delicious brownies i have ever laid my eyes upon. you are spectacular. Thanks Caitlin. I tried really hard to capture the texture, because they do look like a dark brown block:) but you have to bite into them to find all that fudgy meltyness thats going on. Wow, does dessert get any better than this?? Amazing recipe! I love chocolate, especially when paired with sea salt. Something about the sweet and salty combo I can’t get enough of! I love that salty sweet combination too! Can we sub 1.5 c AP flour instead of the spelt and cashew flour? you might need a bit more (a few Tablespoons more) flour. 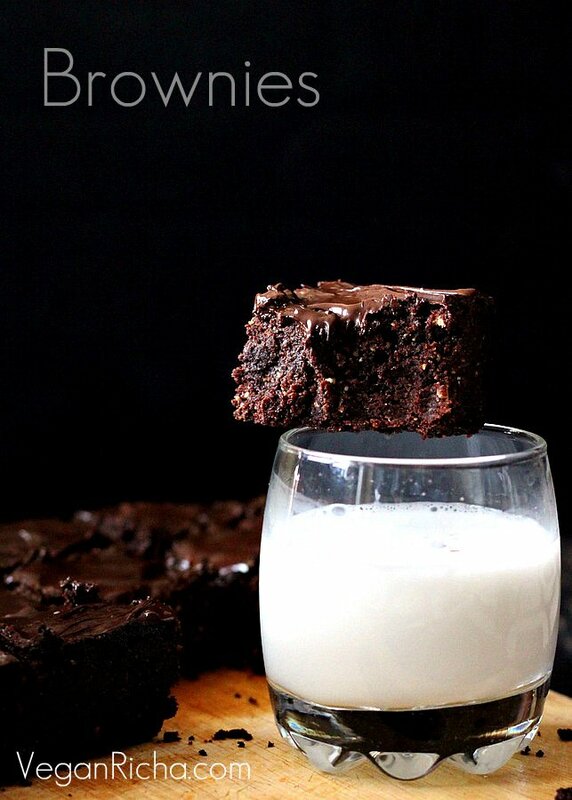 These brownies look so luscious! And the prize for the most drool-worthy brownies I’ve ever laid eyes upon goes to Miss Richa! Wow! These look amazing. What temperature ought I bake this at? I cannot find the temperature listed in the recipe. at 365 F(updated instructions). if you baked at 350, it will bake fine too. probably will take another 5-10 mins. 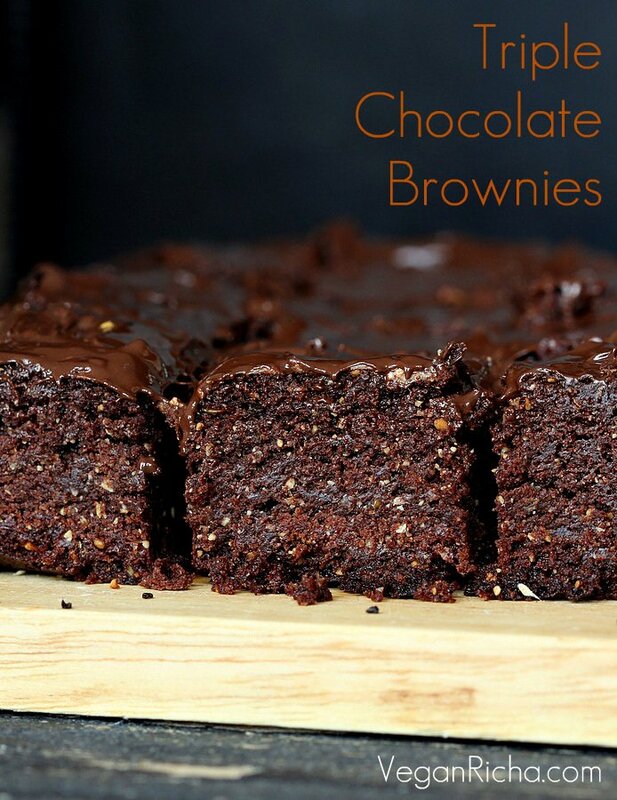 SUPER yummy brownies….these look irresistible!!! love the first click! I had plans of making a batch tomorrow, but now I just want to have some for dinner tonight. 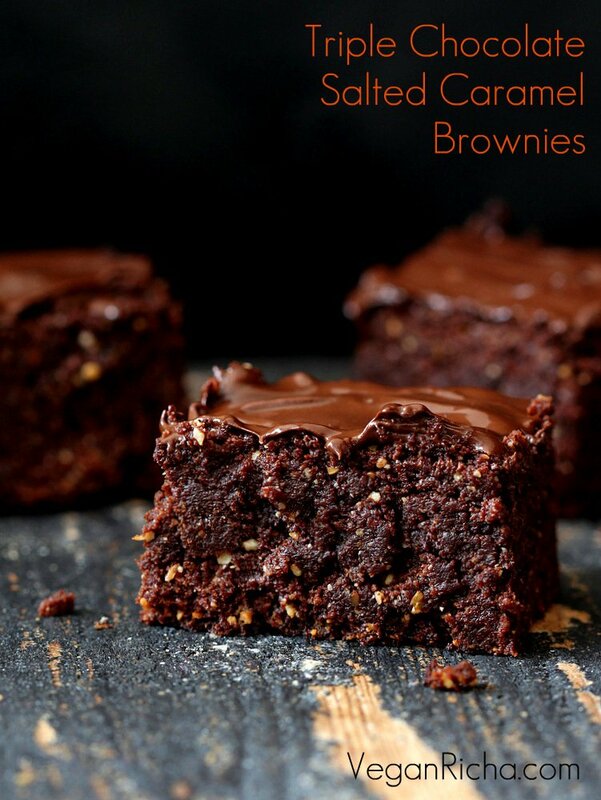 That looks decadent!If I make these I will feel compelled to share! Oh wow! Those look extremely droolalicious!!! I’m convinced, I’m convinced! Bring me some brownies!! So sad for the Hubbs and his anti-chocolate phase – though it could be worse (for us). YOU could be going through an anti-chocolate phase!! Yes, please, Richa! :-)) BTW, I finally got a *real* photo editing program (that wasn’t my computer’s default editor), so now I’ll have a lot more photo capabilities. Can’t wait! Congrats, BTW, on all your new successes with VegNews, etc. You deserve it so much! Wow. Just… Wow. They look so fudgy and chocolatey and decadent and AMAZING! With caramel AND melted chocolate chips on top? That’s so dangerous — I’d eat the entire pan all by myself! Great post! Sharing tomorrow (well, it starts tonight). I am so confused about coconut cream though….what is it? Like thick coconut milk? Or coconut butter? Thanks! Thanks Adrienne:) Coconut cream is the really thick cream that separates when a full fat coconut milk can is chilled. It makes for great whipped cream too. Do they taste like coconut? They look delicious and I want to make them, but MANNNN that last photo really makes me miss MILK. Like moo milk. I’ve not found a single vegan milk that I can drink by the glass. Sigh. Still, I’m making ’em. Yay! Do you have to mix the rest of the brownie ingredients with the caramel? Or could you swirl the caramel through the brownie batter? yup. There isnt enough liquid in the rest of the ingredients to bring the batter together. the mixing to make it into a stiff batter itself will cause the caramel to get incorporated evenly. I have used another caramel recipe as I couldn’t find any molasses. However I’ve just realised I’m not sure how much caramel I’m supposed to use? i would do 1/3 cup caramel. 😀 AWesome.. so glad your family loved it! you can add more chocolate to it;) a bit more more cocoa powder and chacolate chips will work with the same measurements for other ingredients. Got these babies in the oven now!!! All I can say is the batter was addictive, I had to practice some serious self control! Can I substitute the molasses? Can’t wait to try these! I havent tried coconut flour. The liquid absorptiona nd fat content will change quite a bit. You can use whole wheat flour and other nut flour or skip the nut flour and use mow wheat flour. what can I use instead of coconut cream? I don’t like coconut for health reasons. I’m not a fan of it for health reasons. You can use any non dairy milk. 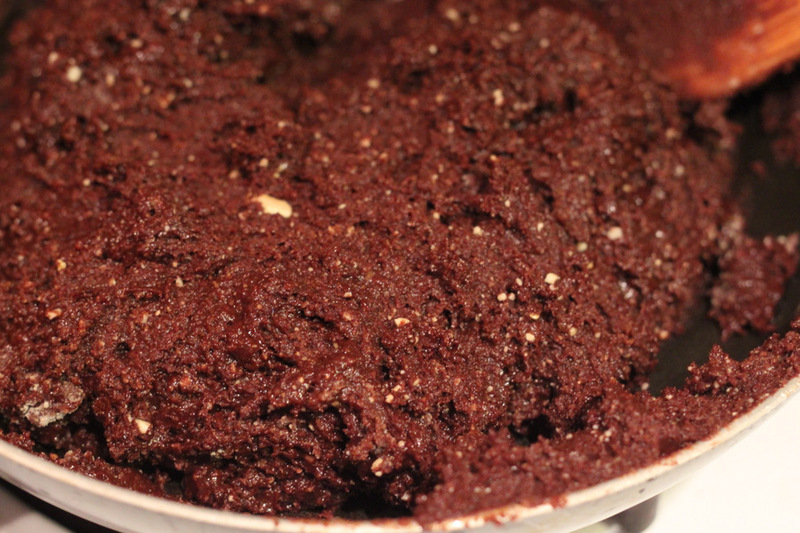 Add 2 Tablespoons more oil in the recipe to keep the brownies moist. Let me know how they turn out! I made these, and I absolutely love the saltyness they provide. I sprinkle my own cookies with Himalayan pink salt for an extra kick. BUTTTT. They came out a little to dry and crumbly. What tips do you have to make them a little more gooeier. I did use regular flour instead of spelt and almond flour instead and cashew. Do you think this contributes to the problem? If so, how could I resolve this? Hi Pia, Yes, whole wheat flour makes a difference. It depends on the recipe. Start by using 3/4 of the wheat flour and see the consistency. There is enough fat in the recipe for a little added flour. maybe it was baked a bit longer. you can also add a bit more chocolate chips and a bit more oil. with all purpose flour the baking time will be a bit shorter. Maybe the caramel got too thick? What if you warm them a bit in the microwave or oven, do they still stay dry? I dont use all purpose flour in baking anymore, so it will hard to guess what else you can change. There is a good amount of fat and chocolate in these to keep them from drying out. i’ll try these with white flour and update the recipe. Made these today but they did not turn out. They were really dry and crumbly. I used Chia seeds in place of flax as that was all I had. I did not even bake them that long as I could see they were drying out quickly. However they still taste quite good:) not sure what the problem was. Will give them another try perhaps. Thank you for following your heart and providing us with such amazing recipes. The planet needs more people like you. Thanks! Hi, they are crumbly because of the cashew flour but should generally be moist when you take a bite. I am going to re-work the recipe in the next few days to be very moist, so a change here and there will not affect it. Glad you like the taste. thanks for trying them out! Is coconut cream the same as coconut milk from a can (like Thai Kitchen etc.)? Coconut cream is the cream that accumulates on the top of the can of coconut milk. Refrigerate the milk for a few hours and you will see the separated cream that you can scoop out. What can I use instead of cashew flour? you can use ground up alomds or walnuts or pistachios. or use regular flour and add 2-3 Tablespoons more oil in the recipe. Do you have the nutritional information available by chance?? Do you think you could top these with caramel sauce rather than the chocolate chips or would that make it too sweet? Jeremy’s birthday is on the 7th and he LOVES caramel, but I’ve never made this so not sure if it would be to much. you can add warmed up caramel sauce on top. that will keep the brownies softer as well. sorry for the later reply. i hope jeremy loved them! hi, i wanted to ask what do you mean by brownies will fall apart from the center? 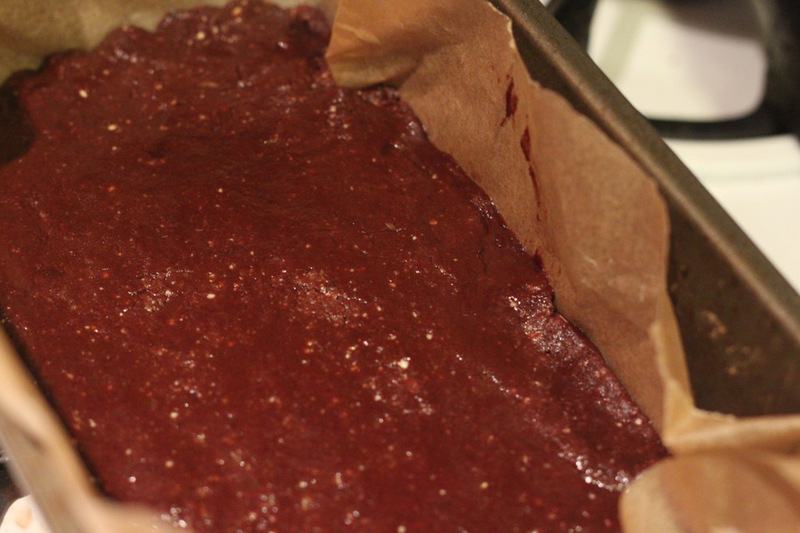 It just means that the brownies will be chocolatey or fudgy in the center and difficult to slice.